After a long hard day at work, all I yearned for was a cold gin and tonic and some friendly banter. I couldn’t face the realisation that had I gone home, all I would have ended up doing is watch crap tv and order a takeaway. A few messages later, and the steak eating fiend who is @baconchop decided to join me for said beverage. A few beers, some chat, then home. Well, that was the plan anyway. Inevitably after a few drinks, our thoughts started to wander to our rumbling bellies and food became a necessity. There may be a thousand places to eat in Soho, but when you are pushed for a decision, you end up wandering the streets listlessly, which is exactly the scenario we found ourselves in. I am not entirely sure how we found our way to Archer street, divine inspiration perhaps, but we stood outside Bocca di Lupo hoping they could squeeze us in. Located opposite its sister gelateria (Gelupo, see what they did there?) it peddles regional Italian food. Not particularly descriptive, but the smells emanating from the open kitchen were enough to convince us that this was definitely the right decision. It was packed but as it was fairly late (9pm’ish) people had started to finish and leave and a few spaces began to appear, there was hope. The exceptional front of house (seriously lovely) told us to hold fire and she would seat us. Even the addition of Adam’s other half and friend didn’t throw her and a few minutes later, we were perched at the bar with our drinks in tow and a glorious view of the action to boot. As lovely as the main dining room looks, a seat at the bar provides entertainment, banter and beautiful aromas, and fuelled with wine and cocktails, we appeared to have lost the best part of our decision making function. We chose a few things, and left a few choices upto our waitress, and sat back to watch the show begin. We watched the chefs throw things in the oil, assemble things on plates and chuck stuff on the grill intently, salivating and hoping that one of the delicious looking dishes was ours. The first things that arrived were a few morsels of fried goodness. 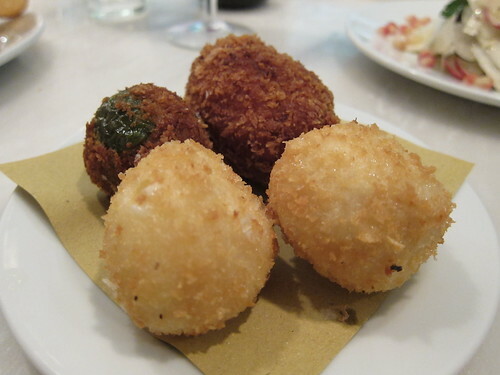 Suppli (Roman arancini, of sorts) bocconcini (fried mozzarella balls) and stuffed olives (stuffed with minced pork and veal, so damn good) were lightly fried and redundant of grease. Next was a simple salad of Shaved radish, celeriac & pecorino, garnished with pomegranates & truffle oil. This wasn’t something that either Adam or myself were going to order, but our delightful waitress (I will be harping on about the service we had on the night, it was amongst the best and most personable I have ever had in any restaurant) insisted on it and I am really glad she did. I was incredibly surprised by the combination of flavours, the rich earthy truffles, the crunch from the celeriac, the peppery radish and the bursts of sweetness from the pomegranates. Stunning flavours, and each recognisable. 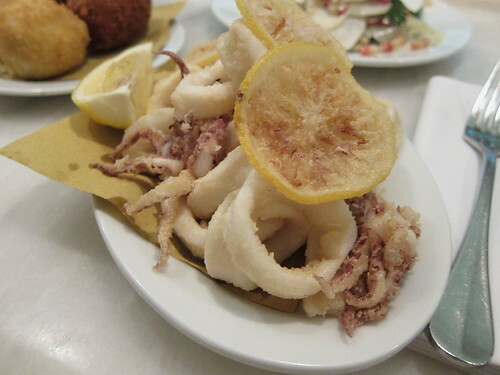 The first round of dishes were rounded off with some of the lightest and most delicate calamari I have ever tasted, lightly floured, quickly dipped in boiling oil and produced fresh and greaseless. A squeeze of lemon and we were ready to go. The pasta and risotto dishes were next. 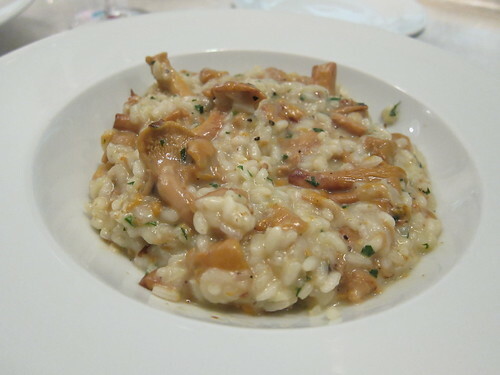 The finferli and asiago risotto was probably the low point of our meal. Packed with mushrooms, you can hardly accuse them of being stingy, but compared to everything else I ate, this was bland and a bit boring. The pork and veal agnolotti were exactly the opposite. Tiny, delicate little pasta parcels packed with flavour in a light sage and butter sauce. This dish totally blew my mind, and I have been hankering for a return visit just to try these again. A most wonderful end to our savouries. We had eaten a huge amount for just two people, but having visited Gelupo across the road, there was no way I could leave without dessert. Managing to convince my dining companion that a chocolate spread made of mostly pigs blood was a good idea (the sanguinaccio was described to us as a funky nutella, must be what sold it), I opted for a somewhat safer option of an ice cream "surprise". 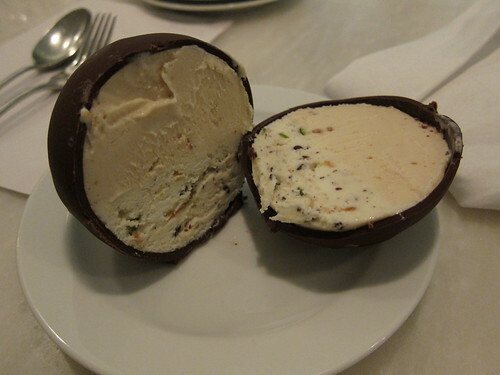 A chocolate shell encasing two surprise flavours of ice cream. The first was chestnut, and being a big fan of nut based ice creams, I was very pleased. The name of the second escapes me, but was packed with candied fruit and tasted of Christmas. This was one of the most enjoyable meals I have had in London, bar none. The food was exquisite, with surprising flavour combinations sitting side by side with simple but clean flavours. The service was stunning and worth visiting for the hospitality of the staff alone. There is still so much on the menu I am desperate to try, yet so many things I have already tried that I desperately want to order again. Yes, the meal was expensive, with it coming to about £60 a head with a few drinks, but when the experience leaves me wondering when my next visit is going to be, there are absolutely no complaints. I am already salivating at the mere thought of it. I've been wanting to try Bocca di Lupo, but it's been hard to get a reservation online at a decent time on weekends! The food looks amazing... I'll have to try the shaved radish salad when I finally make it there. 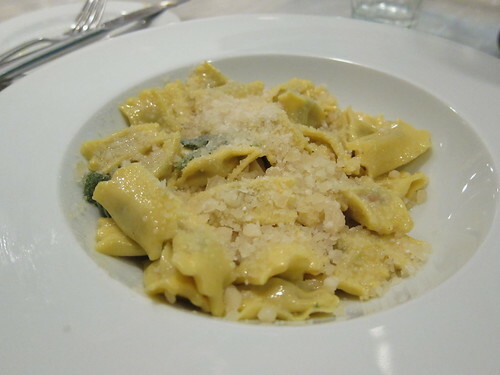 Those agnolotti look stunning. I want! I would never in a million years thought of putting truffle and pomegranate together but the salad does look lovely. 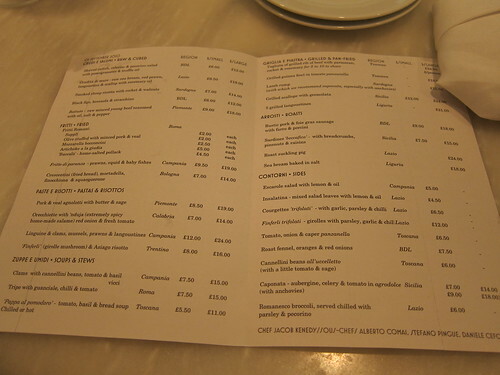 The bar at Bocca is one of my favourite places to eat in London - and it's my local Italian! 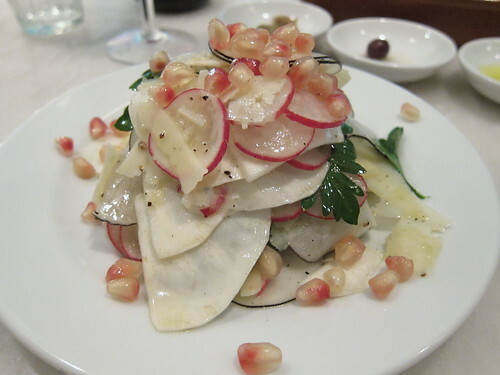 I get that radish salad with the truffle oil and pecorino every time - how good! Some tasty looking dishes there. I shall add it to the list. Love love love bocca di lupo. Isn't it brilliant? You weren't there on friday night were you? Was scoffing ice cream across the road then! Yup the bar is the best place to eat in there as well as in Polpo. I was a tad disappointed when I went. Maybe my expectations were too high. I will give it another try again soon. Looks deicious what you had there! I want to cry a little bit reading this post. I want it all so badly. I've always thought starters were the most interesting part of the meal, and here we have somewhere that seems to mainly serve starter style dishes. Perfect. Loving the sound of the salad and the pasta. I want to go, and I want to go soon. @ The Wandering Foody - It does seem to get busy, but persevere or book well in advance, you won't be disappointed. @ Helen - The pasta was so so good, and the salad, well, taking salad to a whole new level. Clever taste combinations. @ Greedy Diva - Totally jealous. Wish it was my local. @ Catty - Was indeed. And ice cream burger is in my belly next time I go. @ Helena - It was a midweek indulgence, which makes it a little naughty. @ Dave - I have heard of some people also having had a mediocre experience but I definitely think it's worth a return. @ Tobias - It definitely was! @ Lizzie - I am sure we will go in the future, don't you worry. @ The Grubworm - There were "mains" but we avoided these entirely. Stunning. My lovely girlfriends took me to dinner there for a belated birthday treat the first weekend I got back to London after 15 months on the road. We ate an almost completely different range from you! Excited to go back and try more small plates. AND bloody need to get going on that post! 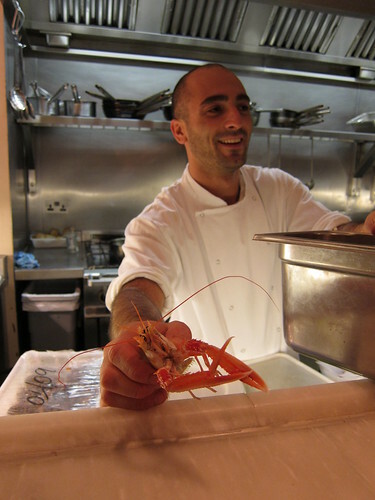 PS Lovely shot of the chef holding the langoustine.